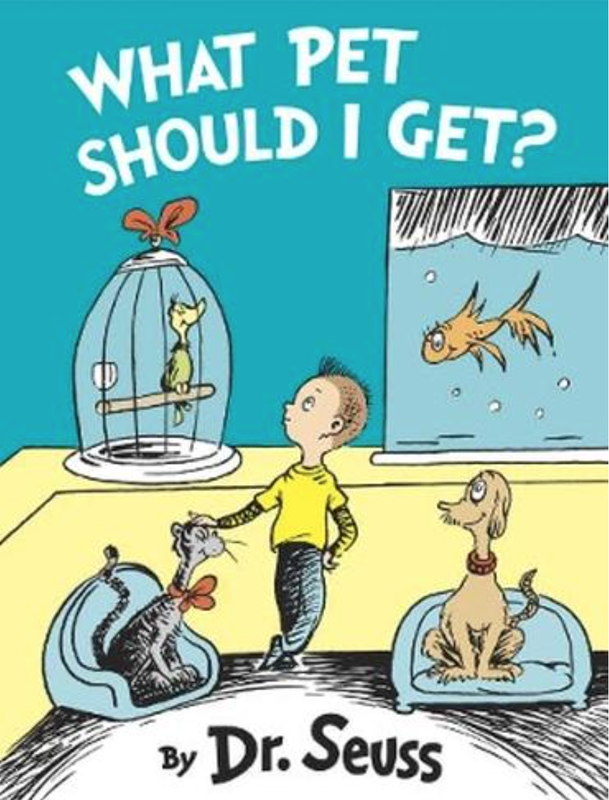 A forgotten Dr. Seuss book entitled, What Pet Should I Get, was discovered in a metal filing cabinet by his widow and will be released in July. This literary barnfind is a sequel to, One Fish, Two Fish, Red Fish, Blue Fish, a reading primer that lacks the narrative drive and radical environmentalism of the Lorax or the pranksterish race-mixing of Star Belly Sneetches. One Fish, Two Fish thrusts young siblings into a world of fantastical creatures: they ride the humps of Wumps, open cans with a Zans, box with a Gox, sing with a Ying, hop with a Yop, make a wish with an Ish and finally fall asleep with a Zeep. And now, in the newly discovered sequel, What Pet Should I Get, these selfsame children will be forced to pick just one pet to keep. Without a doubt, the book will sell, as Dr. Seuss is a blockbuster franchise. With 100 simple words in Green Eggs and Ham, he taught us to read. And in his miraculously subversive way, got conformist parents in the 1960s to lull their children to sleep with books about greed, discrimination, and environmentalism. There is a reason why Dr. Seuss’ books have sold more than half a billion copies. Most of his 40 books are entertaining, witty, fanciful, occasionally profound and re-readable. But is 40 books enough? Random House doesn’t think so. But maybe Dr. Seuss did. Why would an author leave a completed book in his filing cabinet unless he thought it wasn’t good enough?